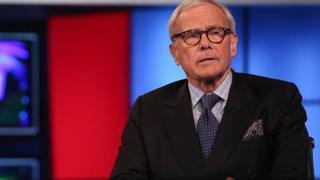 Veteran NBC News presenter Tom Brokaw has been criticised for saying on the network that Hispanic-Americans should “work harder at assimilation”. He told NBC’s Meet the Press he had been arguing for some time that Latinos in the US should be ensuring their children speak English. The remark led to criticism from a fellow guest on Sunday’s show and a social media backlash. The veteran newsman was appearing as a guest on the programme to discuss President Donald Trump’s attempts to get Congress to fund a US-Mexico border wall. He added: “I also happen to believe that the Hispanics should work harder at assimilation. “That’s one of the things I’ve been saying for a long time. He said he was “truly sorry” for remarks that he acknowledged were “offensive to many” and praised US diversity.